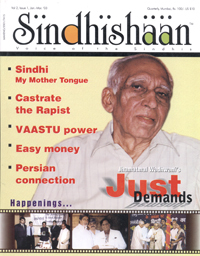 I was simply astonished (actually shocked) to read an article in “Sindhishaan” on Hiro Hingorani. The writer / interviewer has described him as “genius” painter. It is surprising that during his seventy-seven years of age, the “genius” has not won any Regional / National / International Award! I have seen him in hotels where for the sake of earning little money, he dabbles into drawing caricatures of persons. So far, so good! But to give him an epithet of a “genius” is outrageous or the dictionary meaning of “genius” will have to be changed. Hiro Hingorani styles himself as scientist, freedom-fighter, dramatist, humorist, mime-artist, emcee, puppeteer, dancer, musician, singer, writer, poet, designer, psycho-palmist, cartoonist and a photographer. He has forgotten to call himself a painter. One is pained to see that he takes such arts so lightly. And all the arts of the world are concentrated in one person !! He calls ‘Freedom Fighting’ and science also as ‘arts’. Above all, having a degree in science does not entitle him to call himself a ‘scientist’ it is so preposterous. Also, did he go to jail in the ‘freedom-movement’ as to label himself a ‘freedom fighter? Has he any proof for that? I know for certain that he never went to jail in the freedom movement as to claim the position of a ‘Freedom Fighter’. I know him personally, and except for his tolerable surface-paintings, he is NIL in each and every sphere as listed by him. There should be some check on his bluffing. There are so many responsibilities of the interviewer. He cannot write anything just because he has to write something and fill pages. Had the interviewer taken little care, in no time he should have found out that the interviewee is just fooling. The interviewer should not lack commonsense to that extent. He should have at least verified the claims made by Hingorani before writing on him. Had he done that, he might have dropped the idea of writing anything on him. The beautiful image of ‘Sindhishaan’ should not be sullied by such pampering, which is not justified by facts. Infact, in the whole world, such a person does not exist who wields so many arts at a stretch. Even the Guinness book will fail in their efforts to locate such a person. Hingorani is just a surface-painter, painting, like any other art, is a creative art. Mere portrayal of persons lacks an artistic vision and Mr. Hingorani’s paintings belong this category. He can at the most be called a ‘Drawing teacher’. PS : I hope you will publish this letter in “Sindhishaan”.